The rise of cyber-attacks means ensuring the security of your IT infrastructure can now be a full time job. The stats around cyber crime are worrying with 99% of malware being deployed by email or the web (source: Verizon 2018) and with 91% of malware using the web to function once it lands (source: Cisco Cybersecurity Report 2018). When you add human error into the equation the picture gets worse with 32% of organisations saying they weren’t confident their employees could spot and defend against malware or ransomware attacks (source: Vanson Bourne). At Atlas Cloud, we’re one of the only providers of Mimecast in the North East, and have partnered with them to provide web security products for our customers across the UK. Mimecast have established themselves as experts in email protection and now they have applied this expertise to the world of web protection in order to add an extra layer of cyber resilience. Mimecast Web Security is designed to protect against advanced phishing and malware attacks that come via web, instant messaging systems, social network sites and advert networks. It allows customers to expand and improve their protection levels from attacks which occur via the web and email. It is available for both Microsoft Windows and Mac operating systems and uses the same administration console as Mimecast’s Secure Email Gateway giving you one single integrated service. Proactive Protection – acceptable web controls applied to determine if a site is malicious before a user reaches it, without slowing response times. Administrators can control which category of sites users can visit. These policies can be set at a site, user or group level. Download inspection – all files downloaded via Mimecast web proxy service are checked. 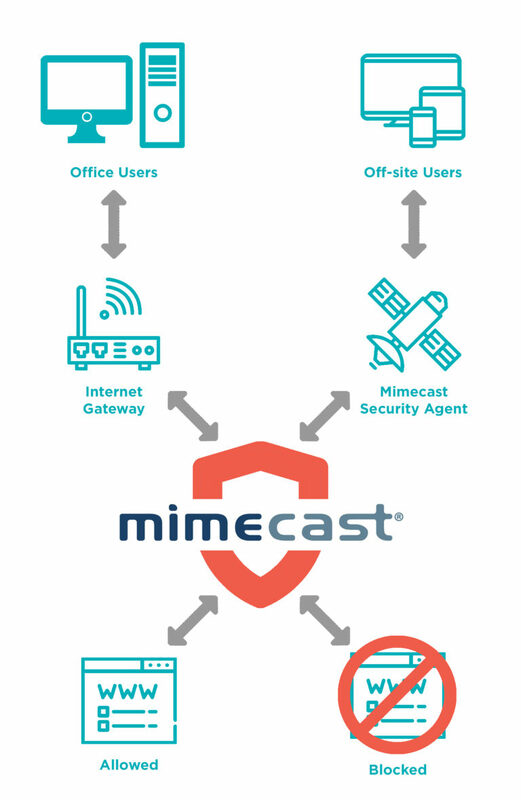 All-in-one interface – Web Security is fully integrated with Mimecast’s Secure Email Gateway interface giving administrators a single easy-to-use platform. Includes: top 10 accessed domains, top 10 site categories, top 10 blocked domains and top 10 blocked site categories. Continuous improvement – collects information from all users of the service to continuously adapt and improve to protect against new threats. New functionality is regularly deployed automatically to ensure industry leading protection. A user makes a request for a web-based resource by clicking on a link or typing an address. This request is forwarded to Mimecast Web Security for resolution and inspection. Mimecast Web Security applies acceptable use controls, as well as any bypass exceptions, and decides whether the site is safe or not. If deemed unsafe, the user is notified that the site is blocked. If deemed safe access is allowed immediately with the IP address of the requested site being returned to the user’s browser. All activity is logged and reports are available for administrators to review.